Back to the building of the house in Concord. One of the things that the client really wanted to think about was using stone on the house-especially the front elevation. We had seen a house that we loved done by architect Gil Schafer III in NY State. 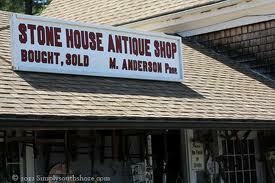 What became very clear as we googled,researched and discovered was that stone is not prevalent in Massachusetts. You see beautiful stone houses in Pennnsylvania,New York ,New Jersey and even some in Connecticut but definitely NOT in Massachusetts.Ironically, there IS one stone house here in Concord right on Lexington Road (pictured above) .It was built by Cyrus Pierce in 1850 but I am not certain how it came to be made of stone. 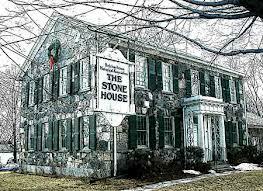 Stone’s Public House in Ashland(the fact that it is called “The Stone House” might make you realize that it is rare! ),Stone House Properties(Real Estate),Nason’s Stone House Farm Store in West Boxford(famous for “awesome chicken pies!”) and that is about it. There were a few new houses but they really looked new and that is not what we want. 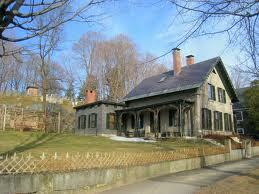 There were definitely no federal style farmhouses, and that is the way we are all leaning. This entry was posted in architecture, books, Boston, building a house, Concord, family life, historic homes, history, Massachusetts, Pennsylvania, photography and tagged architecture, Boston, building a house, Concord, History, Home & Garden, Home Improvement, Massachusetts. Bookmark the permalink. I see you are enjoying yourself in this project. God bless you! People ask if we put in the granite here etc. etc. I say “no” everything was perfectly to my liking when we moved in. All we did was paint the walls.